Asus has finally starts rolling out the Marshmallow update for Zenfone 2 (ZE551ML/ZE550ML). Asus ZenFone 2 Laser and Zenfone Max already received the Android Marshmallow update. The update is an Official build which rolled out in phase wise manner. The update is rolling out via OTA (Over the Air) but for those who don’t want to wait for the OTA can manually Update ASUS ZenFone 2 to Marshmallow. The ASUS ZenFone 2 runs on Android Lollipop but now you can Update ASUS ZenFone 2 to Marshmallow. The new Marshmallow update packed with features like Now on Tap, Doze Mode, App Permissions and more. The Android 6.0 Marshmallow update for ASUS ZenFone 2 ZE551ML and ZE550ML is available via OTA (over-the-air) and it is about 1.1GB in size. Here we provide you the OTA zip file with that you can Update ASUS ZenFone 2 to Marshmallow manually via ADB or recovery. Before you Update ASUS ZenFone 2 to Marshmallow check the release note from below. Latest Android 6.0 Marshmallow update for ASUS ZenFone 2 ZE551ML and ZE550ML is rolling out and soon other zenfone variants will receive the Marshmallow Update. Asus ZenFone 2 Marshmallow Update not only bumps the version to Android 6.0 but also it removed a dozen of unwanted bloatware and comes with many improvements and bug fixes. To Update ASUS ZenFone 2 to Marshmallow manually, first download the FOTA file for zenfone 2 from below. Make sure you at least 2GB of free space on your device. This process is only for ZenFone 2 (ZE551ML and ZE550ML) so don’t try this on any other variant. The update won’t work if you disabled any system app or move APP2SD. Please move apps to internal storage before system upgrades. I am not responsible for any damaged hardware or software arising from this process, so proceed at your own risk. Battery level should be 75% before you Update ZenFone 2 to Marshmallow. It is recommended to take backup of your device and do a factory reset after installing the update if you are facing forced closed error. 1) To manually check the update, you can head over to Settings > About phone > System updates > Check For Update. 2) Enable ‘USB debugging’ option from setting>developer option>. To enable Developer Options, go to About phone and tap the Build Number 7 times. 3) Download ADB and fastboot driver for windows or ADB and Fastboot for Mac and install it on your PC. 4) Download the Android Marshmallow for Asus Zenfone 2 ZE551ML and ZE550ML from above Copy ROM to a folder (If using ADB Method) or rename it to update.zip and save it your phone internal storage (If using Recovery Method). 1) First, Download the files from above. 5) On Marshmallow ROM folder press shift+right click and click on open command here. 9) Done! You Update ASUS ZenFone 2 to Marshmallow successfully. 2) Now Turn Off your phone and boot into recovery mode by pressing Power+Volume UP. 3) Now in recovery mode choose to apply update from sdcard. 4) Now select update.zip file. 5) Now wait until the process complete and then Reboot the phone. 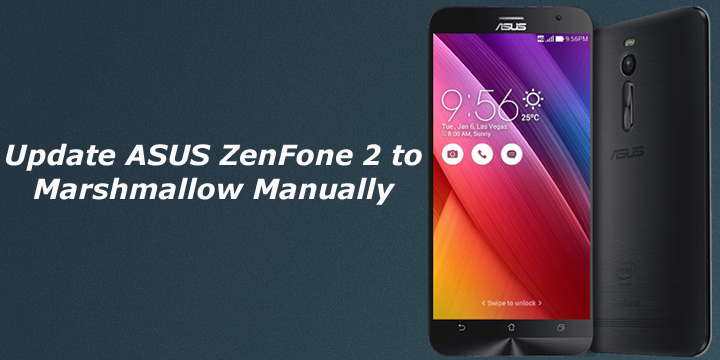 This is the easiest way to Update ASUS ZenFone 2 to Marshmallow manually. If you have any questions, comment below. Sumit is a Tech and Gadget freak and loves writing about Android and iOS, his favourite past time is playing video games. When phone vibrate release Power button. Type Volume down twice untill you see Recovery Mode. Hit power button. 3) Now wait until the process complete. Thank you for another and easiest method it helps lot of users. Can it be used to downgrade from marshmallow to lollipop? hi, i see “error” when the progress is around 30%.. u know any solution for this case? While installing it on zenfone2 551ML battery is at 56% progress is good but after 5mins zenfone suddenly turned off and did not turned on anymore.Tried using 3 different charger but to no avail.used the charger on my low end fone it worked. What could have happen to my zenfone any ideas?? I guess you’ve bricked your phone. Sorry..
Now what i feared most could the hardware have been damage?it doesnt charge anymore.Does not power on when holding the power button. it says file not available…so any other ways to get that file..
Is this for ZenFone2 deluxe version as well? Apart from when I selected recovery mode, an android robot lying on the floor with an error message. Then I press and hold power button and quickly press volume up button to enter recovery mode. There is no update from sdcard option only update from adb sideload option. how update using custom recovery CMW? Using CMW recovery tried to install, factory wipe then install from ZIP then reboot and after nothing dark screen… tied to use power button only vibration and still dark screen… now I do not know what I can do… anybody suggesting? It seems they have pulled it. the fota file download link isnt working anymore, it;s saying file not found, why is that? i cannot see “apply update from sdcard” option from recovery mode. how to do? so it seems FOTA file they shared receives many complaints and issues..
just a thought!! bcoz they just remove the file as early as today..
please provide anither download link for ze551ml.The provided link shows “File not found”. i cannot see either “apply update from sdcard” option in recovery mode. how to do when I’m with stock ROM and Recovery? just when I was excited and eager to update my zenfone 2, it says “File not Found”… I’m always late for the great things.. It was removed because some users had their phones bricked after the update, so consider yourself lucky ! Here is a link that works, I’m served, I start updating with Recovery, all is well! Recovery method doesn’t work on Asus Zenfone 2 (it work on other Asus devices) as reported as users cannot see “apply update from sdcard” option from recovery mode. So it’s better to update it via adb sideload. We have….for months on end. how to revert back to stock rom ??? Wtf happened to your link,? If i do Factory reset after upgrade Android M, then What will be happen with all data which is stored in internal memory??? ?And there is no ota file for ZE551ML above. Asus removed the OTA file from their server..wait for some time I will provide the link as soon as its available. For that thing happen, i will no more buy asus phone again. They cannot give updates on time as they said. http://www.asus.com/zentalk/ph/thread-78668-1-1.html (search for “pasas” user name on the page to get directly to the relevant post with the download links). I haven’t tried it yet as I just found it last night. Still no official OTA ? Anyone got their update? Is possible to update from rooted phone,via fastboot command? Zenfone 2 ze551ml is not getting ota file..while clicking download it seen that ‘file not found ‘.so please tell the solution for m update. For people writing they can’t download the file, scroll down and read the comments. Post from @s8cloud contains a link, follow it and download; it worked for me. As for instructions, all the stuff from the original poster was way more than I needed. I just followed the instructions from first comment, thanks @VilQ, worked like a charm. That said, this 6.0.1 update still has way too much ASUS crap, IMO. FYI: I was not able to download file in Chrome, had to use IE or Firefox with Flash Player. Could anyone suggest steps to uninstall / revert back to 5.0.1? You can check this site, it has links to download the “official” stock Android but I have not tried them myself. If i run this, will it wipe my phone first or update it? It won’t wipe your phone data but still take backup. Post from @s8cloud above contains a link, follow it and look for the post by pasas. ZE551ML after downloading system update, it restarts and says update failed. Wifi is working and also tried factory reset. But same problem. Y? Did you try manual method or update the phone via software update? Done! Using side load method and it worked out well however I see few downsides of marshmallow.. Unfortunately my proximity sensor stopped working too during calls. Has anyone else experienced this? all sensor not work… return to 5… sorry for my bad english. Kie kepriwe dul, inyong ko rodo ora mudeng yaa, nek inyong mlebu neng recovery mode, kn inyong mudun nang aply update sd card kae, orang iso rampung proses se , gagal maning gagal maning bae, lah mumet ndase inyong koh…arep ngerasa ke os mas malow angel temen proses se kon ..
Did anyone resolve the proximity sensor bug? just download android M file from asus support site. paste in the internal memory it will give notification. after update i face lot of problem like charging , very slow charging. more than 2 hour for 40 % charging is done. Charging indicator also not working. I updated just fine but I’m facing some battery draining and sensor problems so I just wanted to get the old version back. But when I tried to factory reset, it came back after the process with the marshmallow version. Do you have any idea on how can I do a REAL factory reset or get the lollipop vc version back? screen goes black, proximity not working properly, restarts frequently, touch stops suddenly and works afterwhile……….. so many issues in marshmallow, Mine device is ze551ml. Screen problem from recent updates …there has been vertical flickering lines and some times horizontal flickering lines…..is this hardware problem or software……? Do you have a solution to install WW version on CN phone? I have a CN one where Google Services do not work.